Puerto Vallarta, Mexico - Imagine giving the year 2011 a drop-kick, then ushering in the New Year 2012 with a Mexican female impersonator who sings, dances and entertains. Chi Chi Rones (no, not the pork rinds) is just that person, that diva, deity to lead the feat. She fills the house at The Palm with deep laughter, quick wit and pace, funny or sad songs, many of which are not well-known, wearing a blown out red dress, intense blond wig and showing girlish legs. Her business cards says: "Entertainer/Drag Diva/Singer". That sums her up well but she is much more. She manages the stage as her private domain and presents not only chit chat but heart-felt thoughts, some of which were emblazoned in her childhood, like the last kid picked for gym squad or when coming to the baseball plate, the outfield shifts in. She is also known as Peter Garcia, an Emmy award winning TV writer. Performing over ten years on RSVP Cruises and in Los Angeles, Hollywood and Palm Springs, we are in the midst of her Puerto Vallarta debut at The Palm on Olas Altas, Southside Vallarta. There is no lip sync here, all her fine voice, with soaring range. Launching into Frank Sinatra memories The Coffee Song (There's an awful lot of coffee in Brazil) and Let's Get Away from it All, she brought the crowd into her casa, swaying and swinging. A Bette Midler favorite, In These Shoes? tickled our funny bone, hearing lyrics about suggesting to her an array of wild adventures and she asks, "In These Shoes?" It was enjoyable her mixing English with her native Spanish. Off came the huge sculptured blond wig for her Judy Garland impression, sporting short-cropped black hair coupled with that deep raspy 'star' voice. I'll Plant My Own Tree from the movie "Valley of the Dolls" quickly led into a quite fine rendition of Over The Rainbow. She hit the final soaring note and held it firmly. Calypso Pete and Mr. Bojangles built to a hilarious revamping of The Harper Valley P.T.A. into "The Tijuana P.T.A." with all the quips changed to Mexican local down-home culture. The mood became softly somber with God Bless the Child and ended with an encore, Before What You Got is Gone. The Palm has slowly but surely established itself as the premier venue for live music in Puerto Vallarta. Lighting, acoustics and balance have been fine-tuned for the intimacy of the space. All seats afford a pleasing view. Tickets can be purchased online at ThePalmPV.com or at the box office starting at 6 pm. Check the website for more info. As Chi Chi says, "If you don’t know Chi Chi, you don’t know Chit!" After one delightful performance, you will know and remember her. The Palm is located at Olas Altas #508, just two doors south of La Piazzetta Restaurant on the South side of Puerto Vallarta. You can also find The Palm on Facebook at The Palm Cabaret and Bar. You may also phone the club at (322) 222-0277 starting at 6 pm nightly. After 20 years in the San Francisco restaurant business, Gary R. Beck turned his attentions to cooking, dining out, creating recipes and exploring Puerto Vallarta's rich array of eateries. 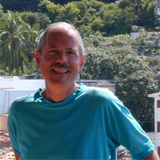 Famous for his restaurant guide, available online at CafePress.com or Lulu.com, Gary also writes restaurant reviews and interesting articles for Puerto Vallarta newspapers and feature columns for BanderasNews.com. Contact Gary at garyrbeck1(at)yahoo.com. Click HERE for more articles by Gary R. Beck.